Hello, my name is Amy-SuiQun Lui. 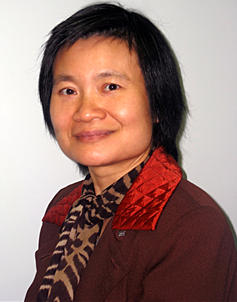 I'm a Cleveland acupuncturist providing gentle and personalized acupuncture treatments for pain and many other ailments. I serve the residents of Cleveland, Cuyahoga and Lake County, Ohio. I’d like to welcome you to my web site where you will find a great deal of information on Acupuncture and Chinese Medicine, or what is also referred to as Complimentary Alternative Medicine. Growing numbers have sought out acupuncturists for chronic pain and health problems when conventional medicine either hasn't worked nor has answers. Medical doctors refer their patients to acupuncturists more than any other "alternative care provider." 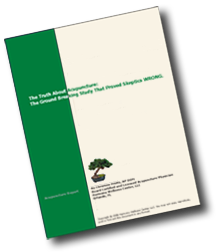 To learn more about Acupuncture and Chinese Medicine, get my FREE Report titled: “The Truth About Acupuncture; The Ground Breaking Study That Proved Skeptics WRONG”. It’s a detailed report on the history of Acupuncture that includes the latest revealing studies, and how Acupuncture and Alternative Medicine work. 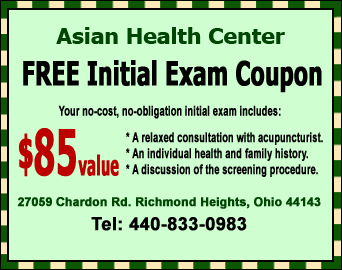 I want to thank you for visiting my Cleveland Acupuncture website, and in return I’d like to offer you a coupon for a FREE Initial Exam ($85 value.) This coupon is good for one initial exam and limited to one coupon per person. If you, your friends, relatives or colleagues are ever in need of my services, please print out the coupon and bring it on your first visit. If you have any questions send me an e-mail or call me at 440-833-0983.